I will confess, I’ve never been a big fan of Mercedes Benz’ automobiles. With the exception of a few of their classic roadsters, I’ve always found their vehicles, both new and old, to be a bit too Germanic for my British-tuned tastes; when you’ve whetted your appetite on lithe Jaguars, there’s little room for a brand that put out a car who’s styling earned it the moniker “Pagoda,” officially. But, regardless, I must admit that they do have an undeniable presence on the road, especially the late sixties/early seventies sedans. 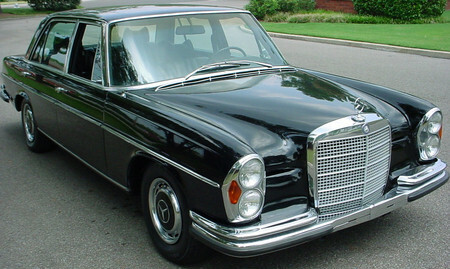 This ’72 280SE is exemplary of the most common Mercedes’ of this era; large, luxurious, and stalwart. Among the first Mercedes Benz vehicles to really be manufactured in any great number, they were available in almost innumerable configurations ranging from spry short wheelbase coupes and convertibles to long wheelbase 6.3L V8 powered monsters destined for the garages of third world despots and dictators. This one, being a sedan endowed with the uber-common 2.8L inline six, is somewhere in the middle of the pack, trading the entry level 280S’ dual downdraft carburetors for fuel injection. This raised the horsepower level to 160 and allowed automatic transmission-equipped cars such as this to hit a surprising 185 kilometres per hour (manual gearboxes pushed that figure to an even 190), with 100 kph being surpassed in just over ten seconds. Now, whether or not this particular example is capable of that performance is another matter entirely. Being both German, and one of the earlier examples of fuel injection extant means that this is one complicated car. However, that doesn’t necessarily translate into this being an unreliable car. Typically extremely well designed and beautifully executed, older Mercedes Benz’ like this offer a unique challenge for the tinkerer as they often don’t require the same degree of constant maintenance that many other classic cars do… but can prove difficult when things do go south as parts can require some diligence to find. Look for rust around the doors, both on the body and the complex joins that form the rear doors’ shape around the latch (as well as all the usual places around the trunk, floors, sills and fenders), but if the ad is telling the truth, corrosion won’t be a problem. Finally, considering most people that bought these cars were established older folks looking for a good, reliable car, check for issues stemming from disuse rather than abuse. These aren’t Mustangs and Camaros; many lived in covered garages, were cleaned regularly, and kept maintained, but a lack of exercise has led many of these cars requiring some mechanical exorcisms. This entry was posted in 70s, Classic, For Sale, Mercedes Benz, Sedan, Vancouver and tagged 1972, 1972 Mercedes Benz 280SE, 280SE, Benz, For Sale, Mercedes, sedan, Vancouver by dfritter1. Bookmark the permalink.